Having great tools to work with makes any activity more enjoyable. Recently, I discovered Geany, a text editor “with basic features of an integrated development environment” in my search for an editor that does syntax highlighting for reStructuredText documents. On Ubuntu Maverick, I had syntax highlighting for gedit, but that doesn’t work anymore under Ubuntu Precise, and I haven’t found a way to make it work yet. As I don’t want to use Vim (its great for basic stuff, but I don’t want to write entire documents in it), which would be another alternative, I hunted the web further until I came around to Geany. Granted, Geany can’t do syntax highlighting either, but it does understand rST besides a whole host of other markup and programming languages. That’s why I am sticking to this software for the time being because it is one step up from other editors I’ve seen. Here’s what a typical Geany window looks like. Selecting the correct language is easy: Go to Document → Set filetype → Choose your filetype. 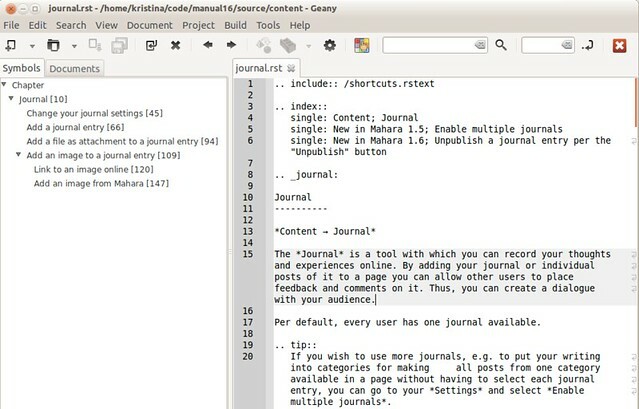 You see the text document on the right-hand side and the structure of the document according to the headings on the left-hand side if Geany knows your markup or programming language. That makes jumping between sections in a large document very handy. All you have to do to get this “Symbol list” is to go to Edit → Preferences → Interface → Select “Show symbol list”. Then Geany also highlights the line of text that you are currently editing / where the cursor is located. This is quite nice when you switch between documents and might have a longer one open where you want to find your position quickly. Since I write text that can consist of longish paragraphs, line wrapping is quite important. I can’t have hard line breaks because they would show up in the user manual I am writing and compiling with Sphinx. However, always having to scroll horizontally would be a nightmare. In the beginning I just went to the menu item and set the line wrapping manually all the time, but got annoyed by this rather quickly because I had to do it every time I opened a document. Thus, I went in search of a system preference because I thought that this should exist. And lucky me, there it was: Edit → Preferences → Editor → Select “Line wrapping”. While there, I also enabled the settings to get rid of trailing whitespace and will see how that turns out. So altogether, it’s been a good experience with Geany so far, and I have only scratched the surface of functionalities included in the software. I hope that syntax highlighting for rST files will be added at some point. It is already on the wishlist to add support for Vim language files which should also solve the problem. I like my Geany on the computer.